« Albany Strollers & Rollers wants YOUR IDEAS! 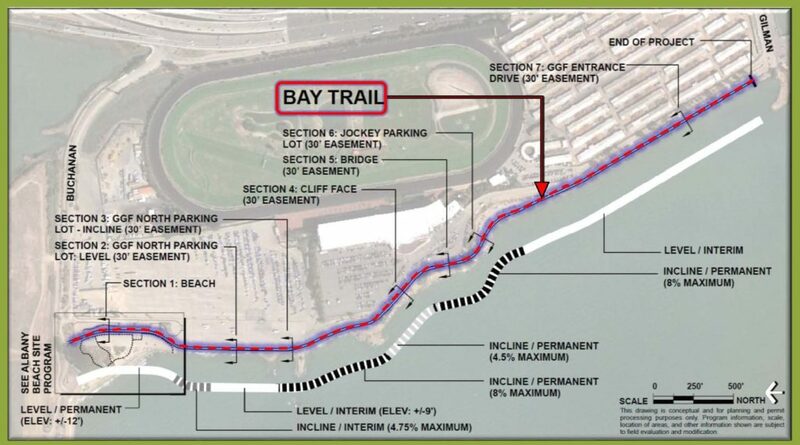 AS&R recently learned the East Bay Regional Park District has developed 30% engineering drawings of the Bay Trail segment it will construct between Buchanan and Gilman. These drawings could not be readily found on the web, so AS&R reached out for help acquiring them. Several members successfully jumped on it, so now AS&R and you have access to a slide deck showing more detail regarding the planned segment. AS&R has not acquired the actually engineering drawings yet, but will keep trying. Here is the map from the slides regarding the planned trail. An interesting aspect of the design is its treatment of flood levels now and in 2050 with sea level rise. In the above map, portions of the trail are indicated as either permanent or interim. Looking at the trail cross sections in the slides indicates the northern interim portion will be below the 2050 sea level plus 100 flood. The southern interim portion will be above this static water level, but a note relays that with storm surge and wave action water can actually lap up to 2.5 ft higher than the static level. At this level, the southern interim portion would likely be underwater as well. The other portions are either along Fleming Point or the expanded beach area to be built. The portions along Fleming Point are obviously elevated, so engineering relative to current and future water levels is not necessary. The portion along the planned expanded beach will be built up so it is above water levels for the foreseeable future. In contrast, both of the interim portions are between the shore and a near sea level portion of Golden Gate Fields. It may be that EBRPD did not want to burden the project with the cost of elevating the trail in these portions because this would increase the project cost by essentially building a levee, which in turn would provide substantial uncompensated benefit to Golden Gate Fields. EBRPD is perhaps instead taking the approach that Golden Gate Fields will eventually determine it is in its own interest to build a levee to protect its property, and at that time EBRPD could join with Golden Gate Fields on a fair cost split. Note again this is all speculation based on the evidence of the slides.